Florent Silve is an Economist at the EBRD. Before joining the research team he worked as a project and energy sector economist in the Office of the Chief Economist. Florent graduated in Economics from the École Polytechnique and Sciences-Po Paris, and holds an MPhil from the University of Cambridge. Prior to joining the EBRD, Florent worked as an economics and finance consultant. As the EBRD’s Transition Report 2013 showed, convergence between the income levels and living standards of the transition region and those of advanced countries has slowed markedly in recent years. In some cases, it has stopped altogether. Last year’s report concluded that much of the slow-down could be attributed to trends in total factor productivity – the efficiency with which capital, labour, land and human capital are combined. At the start of the transition process, countries in the EBRD region generally had unusually low levels of total factor productivity, reflecting the inefficient allocation of resources under central planning. When production factors began to be redeployed more efficiently, total factor productivity initially grew rapidly. However, by the time of the global financial crisis, productivity in the region had reached the levels seen in other emerging markets with similar income levels. This suggests that most of the easy options have now been exhausted. Further improvements in productivity will need to come from structural changes in these economies – in other words, changes to their economic structure and economic institutions, as well as policies supporting reforms and the development of human capital. The challenge of boosting productivity in an economy can also be examined at the level of individual firms. On the one hand, an economy’s aggregate productivity and growth are shaped by macro-level factors – the availability of capital, labour, skills and natural resources – and the efficiency with which these factors are combined and used. On the other hand, though, aggregate productivity and growth also represent the sum of the productivity and growth rates of all firms operating in the economy in question. This report focuses on the various challenges faced by firms across the transition region when they seek to improve their productivity. It makes use of a recent survey, the fifth Business Environment and Enterprise Performance Survey (BEEPS V) conducted by the EBRD and the World Bank, as well as the Middle East and North Africa Enterprise Surveys (MENA ES) conducted by the EBRD, the World Bank and the European Investment Bank (EIB). These unique surveys contain detailed information on firms’ characteristics, performance and perception of the business environment, and they cover almost 17,000 companies. Importantly, the design of BEEPS V allowed independent verification of firms’ responses regarding their innovation activities on the basis of descriptions of their main new products and services. This is important, given that innovation may mean different things to different people (see Box 1.1 for more details). This chapter starts by examining the link between aggregate productivity in the economy and the productivity of individual firms, highlighting the role of innovation. Using BEEPS data, it then looks at the distinction between innovation at the technological frontier (at the global level) and the adoption of existing technology. It also distinguishes between firms’ introduction of new products, the introduction of new production processes and innovation in the areas of marketing and organisation. With these distinctions in mind, the chapter then examines the different strategies that firms across the transition region use to obtain the knowledge and know-how that underpins innovation. Lastly, the chapter uses cross-country data to assess the overall level of innovation of individual economies. Particular attention is paid to countries’ output in terms of patents, as well as the composition of their exports. The “within effect” comprises changes in the productivity of individual firms. The “between effect” concerns the relative market shares of high and low-productivity firms. For example, if the former expand and the latter shrink, the aggregate productivity of the economy will increase. The “cross effect” concerns productivity gains which are driven by increases in the market shares of firms whose productivity is increasing fast. (Thus, the between effect reflects the growth of firms with high levels of productivity, while the cross effect reflects the growth of firms which are rapidly improving their productivity). The “entry effect” reflects the contribution made by new firms. A new entrant contributes positively to the overall productivity of an economy if it is more productive than the average firm. The “exit effect” captures the impact that exiting firms make to aggregate productivity. That effect is positive if the exiting firm is less productive than the average firm and its exit frees up valuable economic resources. Significant barriers to the entry and exit of firms remain. Dismantling these barriers through liberalisation reforms has the potential to give a much-needed boost to the overall productivity of the region’s economies (see Box 1.2 on service-sector liberalisation in Ukraine). The same is true of barriers to the expansion of more productive firms, such as the political connections that low-productivity firms exploit to defend their positions (see Box 1.3). At the same time, now that most of the easy options have been exhausted (in the form of the correction of distortions stemming from the legacy of central planning), productivity gains from firms’ entry and exit will be reliant on simultaneous changes in countries’ economic structures and supporting economic institutions, and change within firms will have to make a larger contribution to productivity growth. Firms’ managers can increase productivity in many ways. They can make better use of excess capacity (if they have any), they can cut costs (shedding labour where necessary), and they can improve the way they manage their businesses. However, the most common and the most important driver of change within firms (particularly in advanced industrialised countries) is the introduction of new products and new ways of conducting business – in other words, innovation.5 Innovation and its contribution to productivity growth and the transition process will be the focus of this Transition Report. Many people would perhaps associate innovation with ground-breaking technology – innovations that advance the global technological frontier. However, while firms constantly work to improve their products and introduce new ones, few of those products are truly new at the global level. Most new products stem from the adoption of existing technologies that have been developed elsewhere, possibly with some customisation in order to better serve the needs of the local market. Although these innovations do not advance the global technological frontier, they can still significantly improve firms’ productivity, thereby contributing to increases in aggregate productivity. So, an innovation is something that is new, original or improved which creates value. In order for a change in a firm’s products or processes to be considered an innovation, it must, at the very least, be new to the firm itself (rather than the global economy as a whole). Around a quarter of all firms interviewed as part of BEEPS reported that they had introduced a new product in the last three years. However, when those responses were then cross-checked against the description of product innovation, that percentage fell to 12 per cent (see Box 1.1 for details of the cleaning process). As one might expect, the percentage of surveyed firms in the transition region that introduced a product which was new to international markets was relatively low at only 0.4 per cent – compared with around 5 per cent in Israel (see Chart 1.1). While around half of all product innovation reported in Israel can be classified as innovation at the technological frontier, in the transition region that ratio is only 5 per cent. However, while innovation on a global scale is encountered less frequently in the transition region, notable examples of such innovation can be found across emerging Europe, Central Asia and the southern and eastern Mediterranean (SEMED) region. For instance, the software behind products such as Skype and the file-sharing application Kazaa was developed by Estonians. Another example is the Akrapovič exhaust system, which was developed in Slovenia. When it comes to the introduction of products that are new to the relevant firm, rather than being new to the international market, the picture changes. Indeed, such innovation is actually more common in the transition region than it is in Israel. This reflects the fact that firms in that region have greater scope for adopting – and sometimes improving – existing technologies and products. Note: Based on cleaned data. Cleaned data on new products are not available for the Slovak Republic, Tajikistan or Turkey at the time of writing. Data represent unweighted cross-country averages and indicate the percentage of surveyed firms that have introduced new products in the last three years. Figures for the transition region include data for the CEB, SEE, and EEC regions, as well as Russia and Central Asia. Productivity-enhancing innovations are not limited to new products. They can also be new or significantly improved production methods – or, for service-sector companies, delivery methods. Examples of such process innovations include the automation of work that used to be done manually, the introduction of new software to manage inventories and the introduction of new quality-control measures. A process innovation may, for instance, help to introduce a new product. For example, buying new machinery in order to start producing a new product involves both product and process innovation. Of the BEEPS respondents that have introduced new products, around a third have also introduced a new process in the last three years (see Chart 1.2). Indeed, product and process innovation may sometimes be hard to tell apart (see Table 1.1 for some real-life examples). Alternatively, process innovations may help firms to deliver existing products in a more efficient, cost-effective manner – for instance, with the help of new equipment or new software. Around 9 per cent of all BEEPS respondents introduced a new process without engaging in product innovation. Around a quarter of all process innovations entailed changes to production techniques, machinery, equipment or software. Process innovation is most commonly encountered in manufacturing, where it is typically related to the upgrading of machinery and equipment. Note: Based on cleaned data. Data represent unweighted cross-country averages and indicate the percentage of surveyed firms that have introduced new products and/or processes in the last three years. Source: BEEPS V and MENA ES. Firms in high-tech and medium-high-tech manufacturing sectors (such as pharmaceuticals or electronics) – and particularly firms in knowledge-intensive service sectors (such as telecommunications or information technology) – are more likely to introduce new products than firms in low-tech sectors (such as wood processing or textiles; see Chart 1.3).9 Regional differences in the frequency of product innovation are also larger in these sectors. For instance, in knowledge-intensive service sectors the percentage of firms that have introduced new products in the last three years ranges from 0 per cent in Jordan to over 25 per cent in south-eastern Europe (SEE) and almost 60 per cent in Israel (see Case study 1.1 for an example of an innovative IT firm with its origins in Belarus). In contrast, differences between innovation rates are less pronounced for low-tech sectors, as firms in these industries generally innovate less (even in Israel). In contrast to product innovation, process innovation is common in low-tech manufacturing sectors, as firms look for new, more efficient production methods (see Chart 1.4). For instance, in Central Asia around 28 per cent of firms operating in low-tech manufacturing sectors have recently introduced a new process. Differences between the process innovation rates of individual countries and regions are substantial across all manufacturing sectors and knowledge-intensive services (albeit process innovation is much less common across the board in less knowledge-intensive service sectors). EPAM, a global provider of software development services, has managed to successfully leverage and commercialise the availability of programming talent in a number of countries in central Europe. In just 20 years or so, it has gone from being a small start-up to a global IT services company that is listed on the New York Stock Exchange. EPAM was founded in 1993 by two native Belarusians, Arkadiy Dobkin and Leo Lozner. The company was based in Princeton, New Jersey, with a development centre in Minsk. As the firm secured more clients on the global market, it gradually expanded, attracting investment from major private equity investors, including EBRD-supported private equity funds such as Russia Partners II and III. In 2012 it then launched an IPO on the New York Stock Exchange, the first time that a software company originating in the region had been floated on a major stock exchange. EPAM now has development centres in Belarus, Hungary, Kazakhstan, Poland, Russia and Ukraine. The company has more than 10,000 engineers serving firms in a wide variety of industries in both developed and developing markets (with clients such as Google, Barclays, MTV, Expedia and Thomson Reuters). Its current areas of focus include cloud and mobile services and big data. The company was also one of the first residents of the HTP Belarus high-tech park in Minsk, thereby contributing to the development of the local IT cluster. Note: Based on the International Standard Industrial Classification (ISIC), Rev. 3.1. High-tech and medium-high-tech manufacturing sectors include chemicals (24), machinery and equipment (29), electrical and optical equipment (30-33) and transport equipment (34-35, excluding 35.1). Low-tech manufacturing sectors include food products, beverages and tobacco (15-16), textiles (17-18), leather (19), wood (20), paper, publishing and printing (21-22) and other manufacturing (36-37). Knowledge-intensive services include water and air transport (61-62), telecommunications (64) and real estate, renting and business activities (70-74). Data represent unweighted cross-country averages and indicate the percentage of surveyed firms that have introduced new products in the last three years, on the basis of cleaned measures of innovation. Note: Based on ISIC Rev. 3.1. High-tech and medium-high-tech manufacturing sectors include chemicals (24), machinery and equipment (29), electrical and optical equipment (30-33) and transport equipment (34-35, excluding 35.1). Low-tech manufacturing sectors include food products, beverages and tobacco (15-16), textiles (17-18), leather (19), wood (20), paper, publishing and printing (21-22) and other manufacturing (36-37). Knowledge-intensive services include water and air transport (61-62), telecommunications (64) and real estate, renting and business activities (70-74). Data represent unweighted cross-country averages and indicate the percentage of surveyed firms that have introduced new processes in the last three years, on the basis of cleaned measures of innovation. Innovation does not always involve new technologies. For instance, it may take the form of organisational innovation – such as new approaches to business practices, workplace organisation or external relations. As with process innovations, organisational innovations may seek to improve a firm’s performance by reducing administrative or transaction costs, gaining access to non-tradeable assets or reducing the cost of supplies. Unlike process innovations, organisational innovations primarily concern people and the organisation of work flows. Examples of organisational innovations include the introduction of a supply chain management system, the implementation of a database of best practices or the decentralisation of decision-making (which gives employees greater autonomy). Marketing is another important area of innovation. Marketing innovations could, for instance, be aimed at better addressing customers’ needs, opening up new markets or repositioning a firm’s product on the market. Examples include the introduction of a new flavour for a food product in order to target a new group of customers, product placement in films or television programmes, the establishment of client loyalty cards or the introduction of variable pricing based on demand. While product, process, organisational and marketing innovations cover a broad range of changes within a firm, not every change can be considered an innovation. For instance, customisation, routine upgrades (minor changes to a good or service that are expected and planned in advance), regular seasonal changes and new pricing methods aimed solely at offering different prices to different groups of customers are not deemed to be innovations. Ceasing to use a particular process to market a product is also not considered to be an innovation. And although a new product represents an innovation for the firm that manufactures it, it does not generally constitute an innovation for firms trading, transporting or storing that new product. Making changes to organisational and marketing arrangements is likely to be cheaper – although not necessarily less risky – than introducing new products and processes. Given the legacy of central planning, where marketing was severely underdeveloped – and, indeed, largely unnecessary – it is not surprising that firms in transition countries are more likely to introduce new organisational or marketing arrangements than firms in Israel (see Chart 1.5). Indeed, around 28 per cent of all surveyed firms in the transition region have adopted new organisational practices or marketing techniques over the last three years, with marketing innovations being the more common of the two. Note: This chart is based on self-reported data, as firms were not asked to provide descriptions of their organisational and marketing innovations. Data represent unweighed cross-country averages and indicate the percentage of surveyed firms that have introduced organisational and marketing innovations in the last three years. The introduction of new products and processes often requires specific inputs, such as spending on research and development (R&D) – in other words, creative work undertaken on a systematic basis in order to increase a firm’s stock of knowledge. While the concepts of R&D and innovation are sometimes used interchangeably, R&D primarily reflects inputs into the innovation process, while new products and services are innovation outputs. For example, R&D activities do not always lead to successful innovation, as a company may spend money on laboratory research investigating a new chemical compound for its paint, but not have any new paints on offer (at least, not for the time being). And conversely, the introduction of new products or processes may not always require R&D spending. Firms in the transition region lag behind Israel in terms of the amounts spent on in-house R&D, despite the fact that some individual transition countries have a higher percentage of firms engaged in in-house R&D than Israel (see Chart 1.6). Slovenia comes closest, with an average of 0.7 per cent of annual turnover being spent on R&D, compared with Israel’s 1.3 per cent. While cross-country differences are small in low-tech sectors, where firms in all countries (including Israel) tend not to invest much in R&D, these differences are more pronounced in high-tech and medium-high-tech manufacturing sectors and knowledge-intensive service sectors (see Chart 1.7). Note: Darker colours correspond to higher expenditure on in-house R&D as a percentage of annual turnover across all firms. The pie charts for each country compare the number of firms that undertake in-house R&D (purple) with the number of firms that do not conduct such R&D (ochre). Note: Based on ISIC Rev 3.1. High-tech and medium-high-tech manufacturing sectors include pharmaceuticals (24), machinery and equipment (29), electrical and optical equipment (30-33) and transport equipment (34-35, excluding 35.1). Low-tech manufacturing sectors include food products, beverages and tobacco (15-16), textiles (17-18), leather (19), wood (20), paper, publishing and printing (21-22) and other manufacturing (36-37). Knowledge-intensive services include water and air transport (61-62), telecommunications (64) and real estate, renting and business activities (70-74). Data represent unweighted cross-country averages. Some R&D can be contracted out to other companies and institutions, rather than being conducted in-house. In fact, BEEPS firms outsource more R&D projects than they conduct in-house. At the same time, in-house R&D projects have a higher average cost. The majority of firms conducting R&D employ a combination of in-house and outsourced work. The introduction of new products can also be facilitated by acquiring external knowledge. This can be done through the purchase or licensing of patented technologies, non-patented inventions and know-how derived from other businesses or organisations. In short, firms can use a range of different approaches to obtain knowledge. Chart 1.8 shows how countries compare in terms of whether they “make” knowledge (in-house R&D) or “buy” it (outsourced R&D, or the purchase or licensing of external knowledge). The horizontal axis shows the percentage of firms that only ever buy knowledge, while the vertical axis shows the percentage of firms that only follow a “make” strategy or employ a combination of “make” and “buy” strategies. 1. Low innovation: In this group of countries, located in the bottom left-hand corner of Chart 1.8, few companies spend money on buying or producing knowledge. This group includes countries such as Albania, Armenia, Azerbaijan, Georgia and Uzbekistan. 2. Buy: Firms in this group of countries predominantly buy technology, with the percentage of firms that engage in in-house R&D remaining relatively modest. Countries in this category include Bosnia and Herzegovina, FYR Macedonia, Hungary, Kazakhstan, Kyrgyz Republic, Moldova, Mongolia, Montenegro, Poland, Serbia, Tajikistan, Turkey and Ukraine. 3. Make and buy: Firms in this group of countries, which is located above the sloping line, are more active in terms of in-house R&D relative to the acquisition of external knowledge. This group could be broken down further on the basis of the extent to which firms tend to engage exclusively in in-house R&D or both make and buy knowledge. 4. Make: Finally, Israel (located in the top left-hand corner) is the only country where few firms only follow a “buy” strategy and a relatively large proportion of firms spend money on in-house R&D. These distinctions are important when designing policies to support innovation in individual countries (as discussed in Chapter 5 of this report). What explains these cross-country differences in firms’ innovation strategies? As one might expect, their level of economic development appears to play an important role. Firms in lower-income countries are generally less likely to engage in either in-house R&D (see Chart 1.9) or the acquisition of external knowledge. However, if they do, they are more likely to simply spend on the acquisition of external knowledge (see Chart 1.10). This is not surprising, since firms in countries that are further removed from the technological frontier naturally focus more on the adoption of existing technologies. This may also be a reflection of insufficient human capital and other limitations in terms of their capacity to conduct their own R&D. Such limitations are also reflected in the source of any external knowledge: in higher-income countries it comes predominantly from domestic firms, research institutes and universities, while in lower-income countries it is predominantly imported from foreign firms, research institutes and universities. Although firms in lower-income countries may find it harder to pursue R&D-based strategies, they can achieve productivity gains in a number of other ways, for instance by upgrading their management practices (see Chapter 2). Note: A “make” strategy refers to in-house R&D, whereas a “buy” strategy refers to outsourced R&D and the purchase or licensing of patents and know-how. The lighter colour denotes countries where the percentage of firms that only ever follow a “make” strategy is greater than the percentage of firms that only ever follow a “buy” strategy. The size of the bubble corresponds to the percentage of firms that have engaged in product innovation (on the basis of cleaned data). Evidence from BEEPS V is in line with country-level data showing that R&D activity tends to be significantly weaker in transition economies than in innovative advanced economies, whether it is measured in terms of R&D spending or the number of people working on R&D (see Chart 1.11). However, these transition countries are not performing any worse than other emerging markets. For instance, Russia and China spend a similar proportion of their GDP on R&D – around 1 per cent. 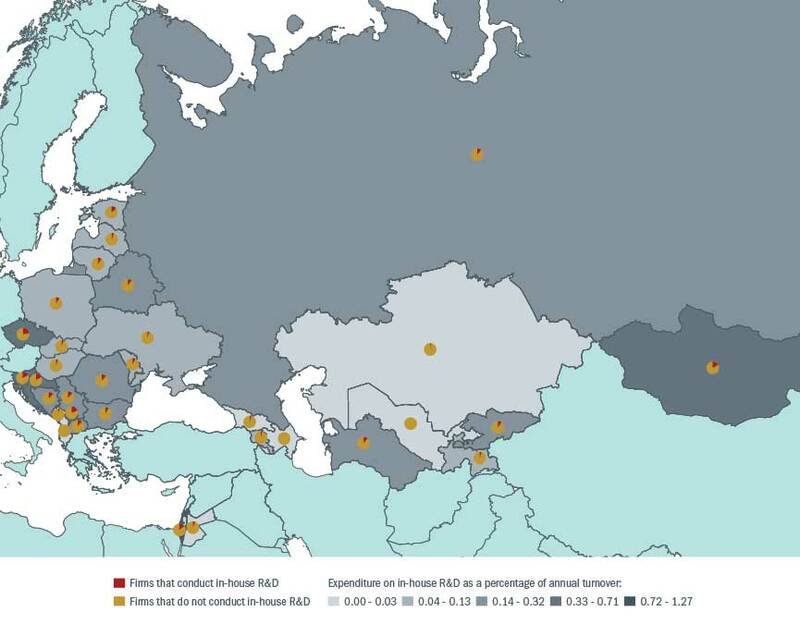 Interestingly, however, the number of R&D personnel in Russia is several times the figure seen in China as a percentage of total employment, partly reflecting a legacy of the Soviet innovation system (see the discussion of science cities in Box 5.4). Country-level data also reveal that firms are responsible for the majority of R&D spending in advanced economies, accounting for an average of 61 per cent of such spending in OECD economies (see Chart 1.12). Firms in emerging Asia account for a similar percentage. As the development of new technologies relies on both fundamental and applied research, both governments and universities have an important role to play. For innovation to be successful, the efforts of governments, academia and industry must complement each other effectively (as discussed in Chapter 5 of this report). Note: The fitted line is produced using a linear regression. Note: Based on 2011 data for 73 countries worldwide. Figures represent unweighted cross-country averages. In the transition region data are not available for Albania, Bosnia and Herzegovina, Egypt, Jordan, Kosovo, Morocco, FYR Macedonia, Tunisia, Turkmenistan or Uzbekistan. Aggregate productivity growth in the economy is largely a reflection of the productivity growth of individual firms, and that stems, in turn, from all the various forms of innovation at firm level – new products, new processes, new marketing techniques and new organisational methods. Most of these innovations do not advance the global technological frontier, simply representing the adoption of existing technologies in order to help firms to boost their productivity. Chapter 2 looks at the link between productivity and innovation in greater detail. As the analysis in this chapter shows, innovation rates vary considerably, both across industries and across countries. Some countries – particularly in the CEB region – have succeeded in increasing the innovation intensity of their exports, while the innovation intensity of other countries’ exports has stagnated at low levels or declined. There are many factors that may account for these differences, and these are discussed in Chapter 3 of this report. Chapter 4 then examines the specific role played by access to finance. Countries also differ in terms of the strategies that firms use in order to obtain the knowledge that underpins innovation. In some cases firms tend to focus on in-house R&D, while in other cases firms tend to purchase technology or know-how. Chapter 5 examines various policies that can be pursued in order to support innovation, taking these differences into account. The Business Environment and Enterprise Performance Survey (BEEPS) is a joint initiative conducted by the EBRD and the World Bank. BEEPS is a firm-level survey based on face-to-face interviews with managers which examines the quality of the business environment. It was first undertaken in 1999-2000, when approximately 4,100 firms in 25 countries in eastern Europe and Central Asia (including Turkey) were surveyed in order to assess the environment for private enterprise and business development. It has since been conducted every three to four years or so. The recent fifth round of the survey (BEEPS V) was completed in 2012 in Russia and 2014 in all other countries. BEEPS V involved more than 15,500 interviews with firms in 30 different countries. The Middle East and North Africa Enterprise Surveys (MENA ES) are a joint initiative administered by the World Bank, the EBRD and the European Investment Bank (EIB). They were first conducted in selected MENA countries in 2013 and 2014. The surveys cover the countries of the southern and eastern Mediterranean (SEMED) – namely Egypt, Jordan, Morocco and Tunisia – as well as Djibouti, Israel, Lebanon and Yemen. Of the SEMED countries, only data for Jordan are available at the time of writing. Both surveys cover the majority of manufacturing sectors (excluding mining), as well as retail and other sectors – including most service sectors (such as wholesaling, hotels, restaurants, transport, storage, communications and IT) and construction. Only official – in other words, registered – companies with five employees or more are eligible to participate. The innovation sections of BEEPS V and MENA ES build on the established guidelines contained in the third edition of the Oslo Manual,22 covering product and process innovation, organisational and marketing innovation, R&D spending and the protection of innovation. In the main questionnaire, respondents are asked – by means of simple yes/no questions – whether their firm has introduced any new or significantly improved products, processes, organisational arrangements or marketing methods in the last three years, and whether that firm has spent money on R&D during that period. In order to foster a common understanding of what innovation is, respondents are shown cards containing examples of innovative products, processes, organisational arrangements and marketing methods.23 Firms that have engaged in any of these innovation activities are asked more detailed questions in the innovation module. Crucially, firms are asked to provide a detailed description of their main product or process innovation. • The customisation of products was widely regarded as a product innovation. In many cases such customisation does not count as innovation. For instance, seasonal changes to clothing lines and the trading of new products by a wholesaler do not count (unless this concerns a new type of product altogether). and marketing innovation. A change of design is deemed to be a marketing innovation, as long as the characteristics of the product are not altered. If a garment manufacturer introduces a waterproof outdoor jacket, that is a product innovation, while a new shape for a line of outdoor jackets would be a marketing innovation. Neither would be an innovation for a retail firm selling such jackets. For a retail firm, a marketing innovation might be the introduction of internet sales. In turn, for an e-commerce firm, a significant improvement in the capabilities of its website would be a product innovation. Even in Israel – which arguably has the most highly developed innovation system of all the countries in the sample – around 60 per cent of all self-reported product and process innovations had to be reclassified. The innovation module also asks firms to indicate whether the relevant product or process is new to the local, national or international market (thereby providing information on its degree of novelty). While it is difficult to distinguish between innovations that are new to a local market and innovations that are new to a national market, truly world-class innovations can be detected with the aid of internet research on the relevant product or process. Thus, internet checks and information regarding patents and trademarks allow us to see whether a product that is reported as being new to the international market can indeed be considered a global innovation. All in all, while it is impossible to ensure a common understanding of innovation across all survey respondents, the BEEPS V methodology and the efforts made to cross-check and reinterpret individual responses go a long way towards achieving comparability of results across countries and firms. This box uses data on almost a quarter of a million Ukrainian firms across all sectors of the economy to provide a breakdown of their productivity growth over the period 2001-09.24 Total factor productivity (TFP) increased rapidly during that period, rising by a total of 60 per cent. Accession to the WTO entailed the adoption of more than 20 new laws bringing Ukrainian legislation into line with the WTO’s requirements, including laws concerning TV and broadcasting, information agencies, banks and banking activities, insurance, telecommunications and business services. For instance, the law on telecommunications that was adopted in November 2003 allowed all legal persons in Ukraine to operate, service or own telecommunications networks. As a result, competition increased significantly, and the country now has four large and four smaller providers of wireless networks, as well as several dozen internet providers. Likewise, financial services were gradually liberalised, allowing foreign banks to open branches in Ukraine. In addition, the circumstances under which the National Bank of Ukraine may turn down a foreign bank’s application to operate in Ukraine were defined more clearly. Insurance services also underwent considerable liberalisation, and laws on auditing and the legal profession were amended to remove nationality requirements. The combined impact of these liberalisation measures can be seen in the breakdown of TFP growth shown in Chart 1.2.1. New, more productive entrants to the market made the largest contribution to overall TFP growth (the “entry effect”, which contributed a total of 44 percentage points). This contribution was particularly large in high-tech manufacturing sectors, such as pharmaceuticals and communications equipment. Firms that increased their productivity also increased their market shares, and contributed 38 percentage points to the overall growth in firms’ productivity. The other components of the breakdown made negative contributions: average productivity growth within individual firms (the “within effect”) decreased, reducing overall TFP growth by 3 percentage points; the market shares of highly productive firms (the “between effect”) contracted, reducing overall TFP growth by 13 percentage points; and firms that exited markets were more productive than the average firm, so this “exit effect” reduced overall TFP growth by 8 percentage points. The productivity of individual firms did increase in the agriculture and manufacturing sectors, and this component contributed 16 percentage points to the overall TFP growth of manufacturing firms. This largely reflects the provision of better services to manufacturing firms as a result of the liberalisation of services.26 Indeed, some of the strongest overall productivity growth was observed in the service sectors (where TFP grew by a total of 75 per cent). This was largely a result of the entry of new service providers, which contributed 67 percentage points to overall productivity growth. Knowledge-intensive services recorded the strongest growth. Interestingly, the mining, utilities and construction sectors – none of which underwent liberalisation during that period – grew at a very slow pace. The analysis in this box shows that policy measures which allow new entrants to challenge incumbents can have a swift and significant positive impact on firms’ overall productivity. Box 1.3, on the other hand, will look at how political connections and a lack of competition owing to the abuse of entry regulations can limit productivity growth by keeping firms “stuck” in a low-productivity equilibrium. Source: Enterprise Performance Statement, Financial Results Statement and Balance Sheet Statement submitted annually to Derzhkomstat (the State Statistics Service of Ukraine), and authors’ calculations. Note: Based on ISIC Rev. 3.1. High-tech manufacturing sectors include pharmaceuticals (24.4), office machinery and computers (30), radio, television and communications equipment (32), medical, precision and optical instruments (33) and aircraft and spacecraft (35.3). Knowledge-intensive services include water and air transport (61-62), telecommunications (64) and real estate, renting and business activities (70-74). Overall growth is shown in percentages, while contributions are shown in percentage points. When markets are distorted, various drivers of aggregate productivity growth may cease to work properly, resulting in a stagnant economy. Such distortions often arise from the misuse of political connections. Political connections can take various forms, ranging from direct ownership, management or control of a firm by political leaders or their relatives to close relationships between the state and the corporate sector, leading to favours being exchanged between politicians and firms (for instance, with firms receiving favourable treatment in return for funding political campaigns). Recent evidence shows that political connections have played a major role in limiting the growth of firms in the SEMED region. This may begin to explain why these economies have been struggling to absorb new labour market entrants, while many economies in south east Asia have managed to use their young and fast-growing populations to their advantage. According to this study, in 2010 politically connected firms in Egypt accounted for 60 per cent of net profit in the economy, while their share of employment was only 11 per cent. Over 70 per cent of politically connected firms were protected by at least three non-tariff measures, compared with only 3 per cent of other firms. Meanwhile, more than a third of them operated in highly energy-intensive sectors, compared with a national average of just 8 per cent. Overall, around 20 per cent of the market value of these politically connected firms was attributable to their political connections. Strikingly, these differences between the profitability of politically connected and non-connected firms disappeared after the “Arab Spring” revolution of 2011. In Tunisia the 220 firms that used to be owned by the Ben Ali family (which were confiscated in the aftermath of the country’s revolution) were responsible for 21 per cent of all net private-sector profits, despite accounting for only 3 per cent of private-sector output, according to a recent study.31 These politically connected firms outperformed their peers, particularly in regulated sectors. Political connections added an average of 6.3 percentage points to each firm’s market share, relative to the market share of a non-connected firm with similar characteristics. As in the case of Egypt, political connections were exploited in order to secure beneficial regulations, particularly when it came to preventing firms from entering the market. All in all, cronyism significantly reduces entrepreneurs’ incentives to create new companies and existing firms’ incentives to innovate, with negative consequences for the growth rate of the private sector. The starting point for the index is the economic complexity of a country’s exports. A country is considered to have a complex economy if it enjoys a revealed comparative advantage in many products that can only be produced and exported by a small number of other countries. A revealed comparative advantage means that the share of a particular good in a country’s total exports is larger than the share of that good in total world exports (implying that a country specialises in producing that good in the global market).34 In contrast, if a country enjoys a comparative advantage in few goods and many other countries have a comparative advantage in those goods, the economic complexity index will be relatively low.35 Countries with a more complex economic structure tend to innovate more, as more complex industries help to develop the skills, technologies and management expertise that support innovation. The potential to achieve innovations that help countries to develop comparative advantages in new industries is captured by a related concept – the opportunity value of a country’s export structure. This measure looks at the complexity of goods in which a country does not currently have a comparative advantage and sees how far removed they are from the goods in which it does, thereby seeing how difficult it would be to cover the distance between those exported goods and potential products. If a country’s export structure has many complex industries in close proximity to its existing export industries, it will be easier to innovate and expand into new products, as those products will require similar skills and technologies and will themselves be conducive to innovation. In contrast, if a country’s export structure has few nearby industries and these are less complex, innovation across industries will tend to be more challenging. For example, developing a comparative advantage in the production of buses will be easier for a country with a comparative advantage in the production of trucks than for a country that specialises in oil refining. 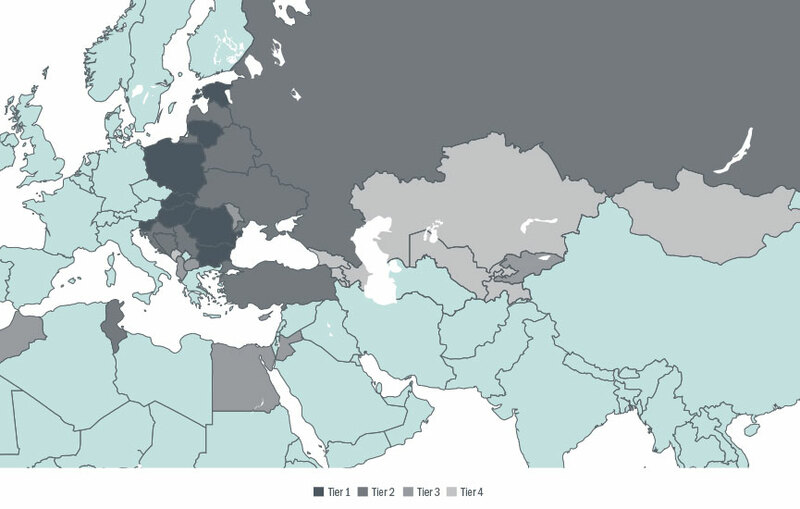 • Tier 1 comprises countries that are already members of the European Union. • Tier 2 is made up of countries that are in the process of developing strong capabilities and have considerable potential for development. This group includes Russia, Tunisia, Turkey and Ukraine. • Tier 3 includes other countries in the southern and eastern Mediterranean, as well as Albania, Cyprus and FYR Macedonia. • Tier 4 mainly comprises countries in Central Asia and the Caucasus, which would seem to have limited potential to increase the complexity of their output in the short term. Source: UN Comtrade and Whiteshield Partners. Note: Darker colours correspond to higher values for the index. Based on 2013 data, with the exception of Azerbaijan, Bosnia and Herzegovina, Bulgaria, FYR Macedonia, Kyrgyz Republic, Morocco, Russia, Slovak Republic, Tajikistan and Uzbekistan (for which 2011 data are used). During the last three years, has this establishment introduced new or significantly improved products or services? Please exclude the simple resale of new goods purchased from others and changes of a solely aesthetic nature. During the last three years, has this establishment introduced any new or significantly improved methods for the production or supply of products or services? During the last three years, has this establishment introduced any new or significantly improved organisational or management practices or structures? During the last three years, has this establishment introduced any new or significantly improved marketing methods? Source: Eurostat and OECD (2005), BEEPS V and MENA ES. Note: The wording above is taken directly from the Oslo Manual and the BEEPS V and MENA ES surveys.